MIDI was invented way back in the 1980s, it’s become extremely useful for producers of all music ranging from electronic music to rock, metal and even classical! MIDI doesn’t actually refer to audio in itself, it’s actually a file or protocol which sends instructions to MIDI devices. Most of us are familiar with MIDI as a series of blocks or notes on a piano roll within your DAW. MIDI also contains information about pitch bends and mod wheel parameters. It’s essentially a code which can be freely transferred between different synths and patches. For example, a MIDI part played on a normal piano synth can be transferred to another synth like Native Instrument’s Massive or Serum. This makes MIDI extremely flexible, transferable and saveable to memory devices and cloud storage. MIDI is perfect for songwriting – you can write melodies, chord progressions, single hits, drum beats – even entire complex compositions – and can then transfer them freely between software instruments. Thanks to MIDI’s flexibility as a musical format, there are tons of free MIDI files available online for download. These can be imported directly into your DAW, placed on any MIDI-enabled software synthesizer and edited to your heart’s content! You can download MIDI files ranging from full-blown compositions of your favorite songs to basic chord progressions, simple melodies, arpeggios, drum beats or almost anything else you can think of. Here, we’ve compiled an enormous list of downloadable MIDI files. These MIDI files by Cymatics are completely royalty free. They’re mostly centered around chord progressions which can be placed on an instrument track in your DAW, synced to tempo and edited with any effects you like. EDM has moved quickly in recent years. From Deadmau5 to Garrix, there are now hundreds EDM classics covering everything from dancefloor bangers to progressive evolving symphonies. The true meaning of ‘EDM’ as a genre has been hotly debated. As you know, EDM stands for electronic dance music, which would technically cover any electronically produced music designed for dancefloors and music events! Whilst producers like Martin Garrix, Calvin Harris and Marshmello have created EDM as its own genre, we’ve included loops here from other EDM producers like Pendulum, who typically produce drum n’ bass. 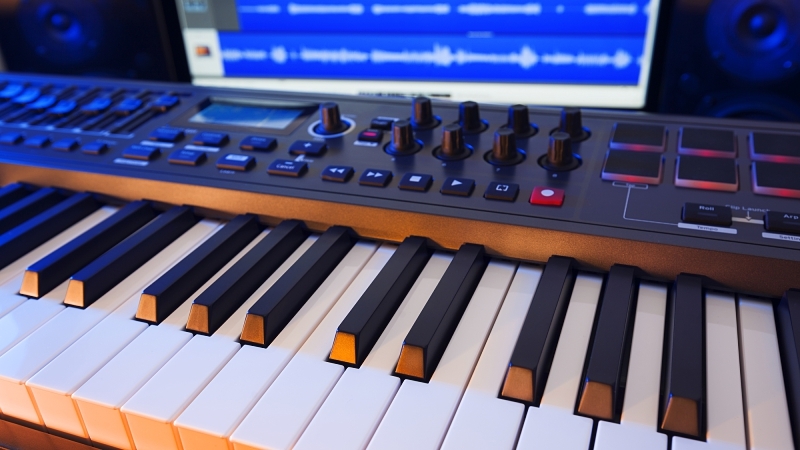 These EDM MIDI files enable you to quickly study melodies from within your DAW. It goes without saying that using any of these melodies directly is copyright infringement! Instead, use them to guide your own composition, songwriting, and structure. Electronica is a bit more abstract than EDM and it often encompasses more complex melodies, drum patterns, and FX. MIDI patterns from electronica producers like Mura Masa, ODESZA and San Holo are interesting to study from a compositional perspective. Pop covers several eras of music from as far back as the 50s. Pop music is extremely diverse and takes inspiration from every other genre, from jazz and soul to newer forms of electronic music. Pop music never declines, wanes or drifts from the mainstream – it is defined by it. It’s no secret that pop music doesn’t try hard to experiment and innovate, it instead provides catchy melodies, memorable lyrics and a general upbeat sense of positivity. Studying pop MIDI files can greatly heighten your knowledge of what goes into creating a catchy melody. Trap is relatively new but RnB and hip-hop have been about for decades. They all have something in common – slow grooves with either dark, melancholic or happy and soulful melodies. Hip-hop is widely known for sampling, the art of readapting and recomposing other music into loops. MIDI files for hip-hop tracks are often simple repetitive loops with hooks. RnB is known for its soulfulness and slow groove. Trap is known for massive beats and slow dark melodies. MIDI files provide insight into how all 3 of these genres are created. Metal and rock songs are some of the most iconic of any genre. Anthemic, melodic, heavy, complex, powerful, soft – rock and metal has it all! Many grew up listening to rock and metal. Bands like Metallica, Pink Floyd, Jimi Hendrix, Guns n’ Roses, Black Sabbath and Deep Purple paved the way for more modern rock with the likes of Green Day, Blink 182, Sum 41 and The Offspring popping up throughout the 90s. More and more metal and rock are being composed in MIDI, taking full advantage of its flexibility and editability. Study these MIDI files and compositions to see how the greats wrote their famous classics. FL Studio was the pioneering DAW for MIDI control. Many of these folders contain entire loadable projects for FL Studio. Some are simple editable melodies and others cover every component of famous dancefloor classics. Finally, here’s an assortment of other MIDI files and compositions from various genres. MIDI is extremely powerful and once you get your head around it, your productions will come on leaps and bounds! This massive compilation should help you view exactly how MIDI can be arranged and composed within your DAW. Simply load the files, load up a synth or instrument and listen to your favorite compositions. Use them to learn about songwriting and composition – don’t steal!